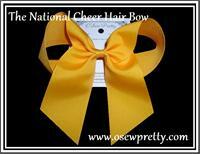 No matter how many times you toss, tumble or jump,your Cheerleading hair bow will stay put! 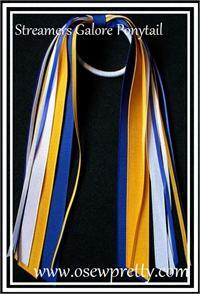 Our jumbo cheerleading ribbons really display your team colors with extra large loops and long dangling ribbon while remaining securely fastened. 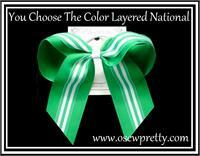 Select your team colors for a custom look hair bow without the custom price. You can also choose between a barrette or elastic pony, although we use the strongest pony holders available, it is strongly recomended that you place your own rubber band in first and then the cheer hair bow as the elastic will last much longer. 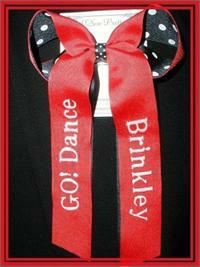 Add that extra touch by having your team or cheerleader name embroidered onto your hairbows. 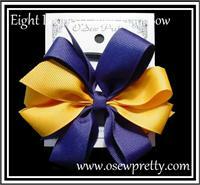 Stand out in a crowd with a full, bouncy and stay put hair bow from O'Sew Pretty! These scream team spirit! 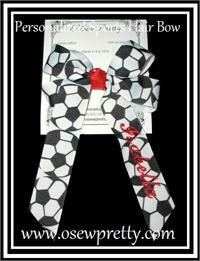 They are made from yards of 3/8" grosgrain ribbon to achieve a full and bouncy bow. Order in your squad colors. 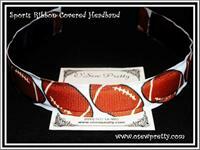 Excellent for cheer, soft ball, or dance teams and they are available in your team colors. 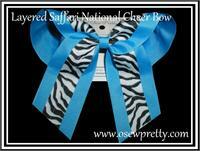 This bow is stacked with fun loops and is available in 5 sporty ribbons. Mix them up to create your team colors. Place this one in your hair and you have a perfectly hand tied cheer bow every time. 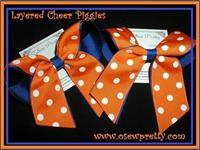 Can be personalized with your cheerleaders names. Do you want to be noticed? Then this cheerleading hair bow is the one. IT'S TEXAS BIG! Choose from over 125 top accent colors and 25 Bottom layer colors to make your own bold and eye catching cheer hair Bow. Your cheerleaders can really show their individuality with our Southern Style Monogrammed Boutique Cheer bow! Ideal for Peewees, Bantams and more! 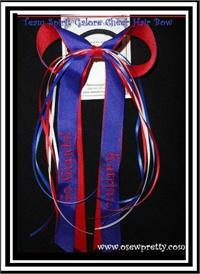 Place this larger version of our Team Spirit Bow in your hair for that perfectly "hand-tied hair bow" look every time. 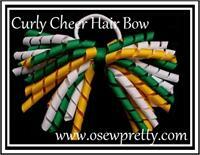 Another great bow for cheer, pom or dance teams. This bow has tons of ribbon with 8" tails! This is just like the Team Spirit Ribbon but kicked up a notch. 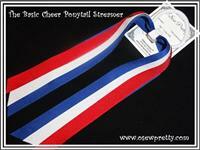 We added even more ribbon to choose from and the tails are 10" long! This Pair of eye catchers are available in all the same colors combinations as the Varsity National . Choose up to four different colors to match your uniform. 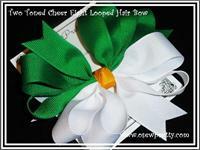 The loops and tail hair bow made in your team colors. 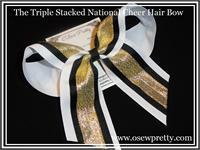 This is our national style cheer hair bow only sized down and twice the fun! Shown in Emerald green polka dot layer on yellow gold. 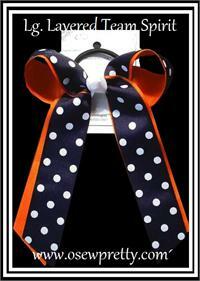 Show your team spirit with these eye catching streamers. Shown in the "NOTHING BUT NET" but available in all sports. 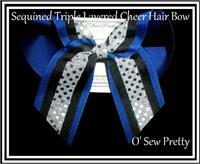 This is a very bold and eye catching cheerleading hair Bow. Your cheerleaders can really show their individuality with our Monogrammed Boutique Cheer hair bow! This is a very bold and eye catching Hair Bow. Shown in black and white zebra on top of copen. This has all the full loops of our Eight Loop bow with a slightly different look. 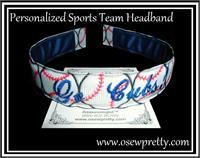 Show your team spirit with these eye catching Headband. Shown in the "TOUCH DOWN" FOR ALL THOSE FOOTBALL FANS. 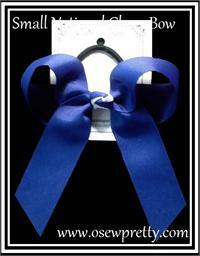 The Original Bow Dangle TM is a personalized hair bow with your child's first name added to the "dangles" of the bow. 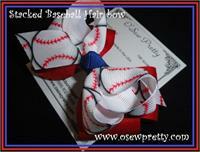 Available in your choice of letter style and sports fan ribbon color, the Original Bow Dangle TM is a real treat! Excellent for cheer, pom, or dance teams and is available in your squad colors. 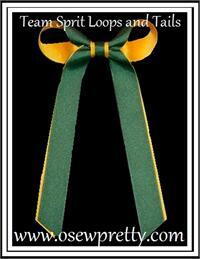 Each bow can be personalized with your cheerleaders name in your choice of lettering style. This is a very bold and eye catching Hair Bow. Shown accented with a Silver Sequines, black middle and Century Blue Bottom. This is a very SASSY, CLASSY and eye catching pair of Hair Bows. Keep your hair in place with this stylish ponytail holder. Makes the perfect school accessorie. 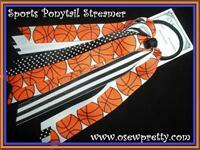 Choose from basketball, football, Volley Ball, soccer or baseball themed ribbon. Then add the teams color as the thread choice and you'll have the perfect team headband. 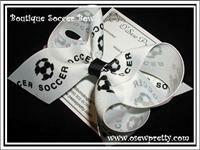 Keep her hair out of her eyes and on the ball with this perfect soccer ball hair bow. Layered for extra color pizzazz!